My electric utility has an online tool to help you examine your home electric use based on basic features of your home and your electric bills. The exact usage is estimated but its pretty close to reality in my experience. 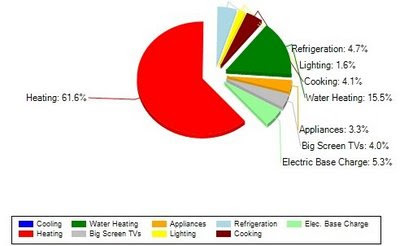 My home energy usage is pictured as a pie chart with % for each major category. As you can see the major expense for us is the heating costs accounting for 61.6%. We have an electric forced air furnace for our heating and no air conditioning so its no surprise that heating is our biggest expense. The next biggest expense is the water heater at 15.5%. Besides being mildly interesting, why is this information useful? If you're going to tackle a problem then its best to put your efforts where you stand to gain the most. When trying to cut costs it makes sense to target the area with the most to gain. Look for the area that accounts for most of the spending and start there. cooking usage by 75%. Tackling the biggest contributor to the problem first will get you the easiest gains.